This is described by Lynn as having multiple sizes of burgundy hexagons and squares in a dark blood-red base with scattered black and red multi-sized accents. Suitable for any blood type. I used the Glitter Tamer top coat, and this is a new product from Lynnderella. I believe the larger orders received a free bottle, and she is testing the waters to see if it becomes a permanent addition to her product line. 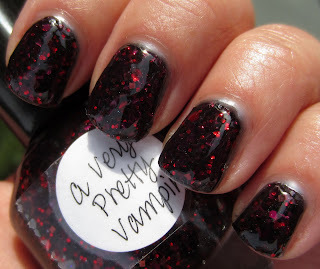 Review of Glitter Tamer: This is rapidly becoming a favorite top coat for me on glitter polishes. It does an incredible job of giving a smooth finish on the most unruly of glitters, it defines and enhances the glitter, it eliminates the tiny fish eye bubbles that I sometimes get with darker base glitter polishes, and the shine...un. believable. It's like a polyurethane coating for your nails! This is a fairly thick top coat, but it dries very quickly. I can normally get the glitteriest of glitters to look smoother and feel somewhat smoother with a top coat, but Glitter Tamer far surpasses anything else. The only drawback is that it's stringy. You know how when you get toward the end of some base and top coats, you'll notice very fine, web-like strings of the product forming off of the brush? That's how the formula is on this product from the start. Honestly, for all of the good things about it, I'm fine with the little web fly aways. I did add 6 drops of thinner to mine, and it seemed less stringy. I'm concerned about causing some kind of chemical imbalance in it by adding too much thinner, and I'd rather tolerate the little strings than diminish any or all of Glitter Tamer's super powers! Back to my thoughts on A Very Pretty Vampire...she is indeed, very pretty. The formula is sort of jellyish, so I find those a little trickier to apply. The glitter places itself fairly evenly, and I only added a second coat to get more glitter over my nails. Over a darker shade, this reminds me of Deborah Lippmann's Ruby Red Slippers. The blackened base covered my darker Revlon base well, so I have to experiment with this one a little more over lighter bases to see if it makes much of a difference. I just got my invoice for my lynderella's I cant wait to get em in the mail! Is there a way to get glitter tamer anywhere else?? idrinknailpolish~you gave an excellent description with regard to the floating and dimension! Nat K.~I believe this is her own creation (don't quote me on that, but that's the impression I got). Right now, I don't know of another source, but she is likely going to be offering it as an individual item, so hopefully you'll be able to order it soon. it looks great! I love how the flakies in it! Oh my...i'm praying she changes her mind about international shipping. Nice! I don't have any of her stuff, but they sure are pretty! Glitter Tamer sounds ideal. That polish looks amazing! I hate that I had to cancel my order :( But 5 polishes were just not in budget. Wow - I need to check Lunderella out! That Glitter Tamer sounds great. Always an issue for me to have any 'escaping' glitter coming through my clear topper. I think what you used as a base is great. Is she still gonna open her shop to sell more of these or has she given up. :P I can imagine the crazyness that is her life right now with all the shipping and frankening and sending of invoices. Arrianne~yes, she will open again once she gets all of the previous orders filled!